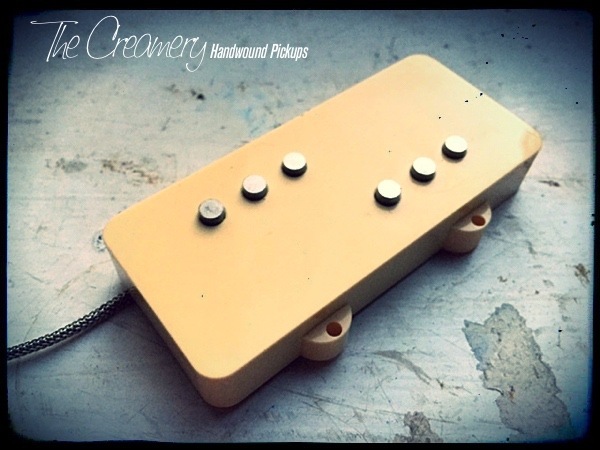 Based on the old Wide Range Humbucker trick where the 6 hidden threaded rod magnets are removed to give a clear, hum-cancelling, fat single-coil sound. The difference with my 'Domino' pickups is that I've designed them to fit a standard Jazzmaster size, so you can have true hum-cancelling, noise-free single coil pickups voiced that will fit any standard Jazzmaster scratchplate and cavity. With Alnico 2 magnets the overall sound is slightly warmer, slightly more resonant whereas with the slightly stronger Alnico 5 the overall sound is a little brighter, more attacking, more focussed with more punch - both with classic single coil sounds in a replacement Jazzmaster size, hum-cancelling pickup. A great pickup if you're after a noise-free, humbucker sized single coil sound. Magnets don't have 'Tone' but they do have strength which has an effect on the overall sound, all other things being equal.